Let's face it, everything in life is better with a little glitter sprinkled on top. Growing up as a blonde, I always felt the need to go against anything pink and glittery in fear of willingly walking into a stereotypical bubble. From the age of 8-18, I shunned the color and crafting must-have like a severely overplayed Taylor Swift song. Nowadays, I'm utterly obsessed and have no shame in embracing the girly staples. (Check out my Barbie bridal shower for proof) The latest addition to my collection are these fabulous glitter heels from Pink and Pepper. I love everything about your outfit today! It's so feminine - and I can never resist a hint or two of girly pink! Cute heels! I also love your skirt. Those heels are so amazing. I really have to convince my boyfriend to me them for my birthday. I like the colors of your outfit too. You look so girly and glamorous!! I like your skirt and shoes very much! Oh my god I love this outfit! Seriously obsessed with this - so cute Anna! I absolutely am in love with your shoes! They are beautiful, just like you! You add accessories so perfectly to every outfit, it makes such a difference and I love your style. I hope you have a lovely week! omg love love love this outfit, its so pretty! the colours are gorgeous! Oh wow <3 you look so gorgeous in this pretty amazing outfit. I really love everything on this beautiful outfit. The glitter shoes, the skirt, the jacket and the pink handbag are just fabulous. Stunning! Have a lovely day , Anna. I love the glitter shoes! lol, you are so funny, Anna. I always love your writing. Would you ever write a book? I'd love to read it. This outfit is beautiful and girly and totally you. love. You are a life size Barbie. This outfit is amazing. OMG. I want those shoes. How do you always find the cutest stuff. Fab outfit, as usual:) lovin the jacket!!! Ahh i just bought a pair of glitter shoes too recently! This is a fantastic way to style them, great idea. :) Your outfit is so beautiful. I love the purple, it looks amazing on you! p.s. I am very envious of your shoes, they're so cute! Who doesn't love pink & glitter. You look amazing. Adorable! I love the shoes! Hey girl! Your blog is looking great and I love these oink and glitter pieces! Adorable! Really in love with this look! YOu look stunning and I loooove your shoes! Love the shoes! I think Barbie would pin this look! Ha! the skirt with the coat is so wonderful! LOL, I love what you wrote! You are a very creative writer, no wonder you're becoming so successful! Love the outfit, and those shoes are beyond fun!! I am sure she would pin it:-) those shoes are just beyond fabulous, I love the whole outfit but shoes are definately the star of the whole look. Please visit my blog to check my last outfit with fall trends. The skirt is so cute, and you are just perfect!! And your skirt is beautiful! 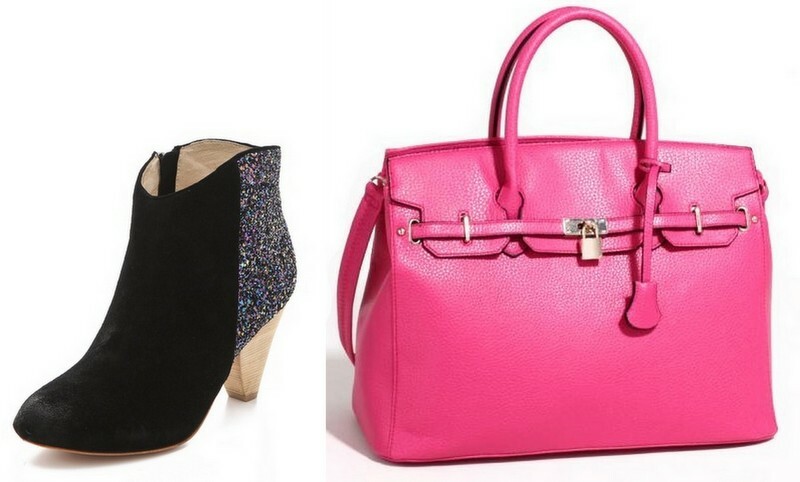 You had me at pink and glitter! This is such a cute outfit. I love it all! Loving those shoes!! The perfect touch of glitter to this outfit! Thanks for your comment on my blog, I'm so flattered you like it! This is such a beautiful look, I often feel the same about glitter as a blonde, especially as I have to fight twice as hard to be taken seriously in Law (Legally blonde much?) But maybe I should go crazy and be the black sheep huh? Thanks for your comment on my blog and for following me. You are a doll, amazing! www.kathrynadaniel.com for all my style must-haves! Thanks for the comment on my blog Anna! I love the skirt! As a fellow blonde I definitely shy away from bright pink hues (I don't want to look like Barbie!) but slowly I am gravitating towards magenta shades! I please please please want all your clothes! LOVE the shoes!! Pink and glitter are my faves!! Ah! The things I would do for a pink Birkin! wow you look great love!! the blazer is cool.. i have a new post up about my big move to canada, would love to hear what you think! 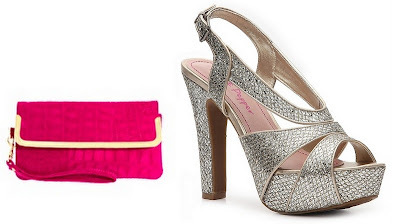 You can't go wrong with pink and a little sparkle! I love the white jacket against your rich plum top. Cute look. Love this look! That skirt is so gorgeous and of course the heels are too cute. I adore that skirt! You look beautiful! So pretty!! I love all the details of this outfit!! Everything works so well together! cute outfit, love the skirt. very girly. You look adorable and those shoes are fabulous! Glitter makes everything better :) Cute outfit my dear. I'm glad you decided to wear what makes you happy. Glitter is also my best friend and always makes me smile when I see shiny, glittery, sequined things. The skirt and heels are super cute! Glitter rocks! You look great and I love the skirt! Beautiful love!! Those heels are amazing! I'm just loving your tweed skirt! omg, you look amazing. So girly and gorg. Love! Another fabulous post, girl. I'm a pink girl too. I love all the pieces you pulled and that pink bag your holding. I hope you're having a great day. You can't go wrong with pink and glitter! 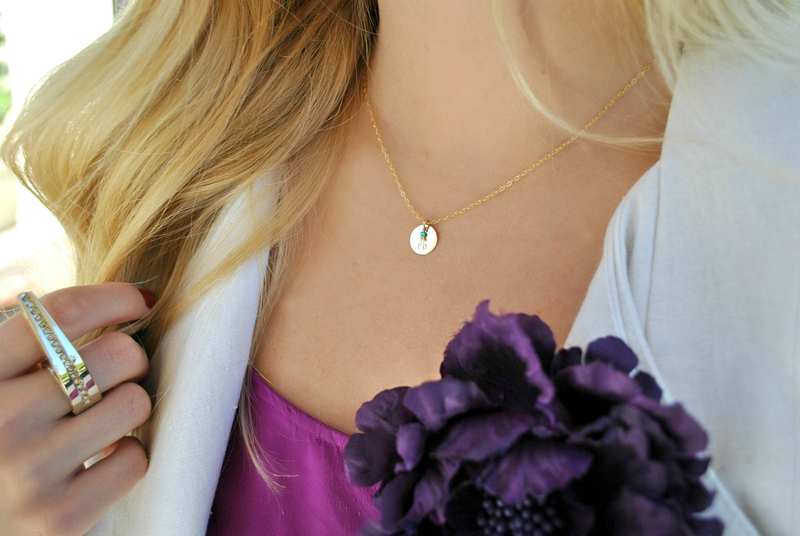 The gold accessories are perfect touches! I LOVE the gold ring! This is the first time I've ever looked at your blog, and I've done quite a bit of browsing! You are extremely inspirational, and have a sassy bite to your style - I love it! Keep up the good work, your mindset is truly uplifting! This outfit is so girly! Love it! This look is so girly and glam! I really like your shoes :) Your skirt is so pretty as well. I think you did a fabulous job at styling this look...but then again, you always do. Love the pink! Super cute outfit! Thanks so much for following us! Would love for you to check out our new post today! You look amazing. Love how you styled this. Cute shoes and I love your skirt! Cute! That skirt is adorbs! Amazing outfit! I adore your skirt. I love all the pink purses! Those shoes are to die for! Thanks for the comment! Thank you for the comment. Your blog is lovely. Beautiful outfit and you're not even close to the typical ''blonde sterotype'' you've mentioned. Your outfit is very classy. Thank you so much for visiting my blog and following me. I'm following you back. Love your tweed skirt girlie:)! I love the glitter flats + bag idea. what a stunning outfit ! I love your glitter shoes ! Great outfit, love the jacket, I really want one like it! I love your otfit, I'm a huge fan of pink and glitter, if everyone wear one of those every day the world would be a prittier place....hhaha!! well, kind of!!! Loved your site, I'm following you!! These shoes are soooo cute!! I'm am seriously in love with you Pink and Pepper shoes! The silver glittery shoes have been a must have of mine since I first saw them! I really love your monogrammed necklace with the turquoise accent on it! I love this outfit! In the past year I have come to embrace my girly side and it's so much fun. The flower on your blazer is a great touch. This outfit is unbelievably fabulous, love the heels!! The increaser is hidden in the rear of the shoe while they look the same as normal shoes or boots. The light weight increaser used ensures that the shoes are light and comfortable. I need those shoes in my life!